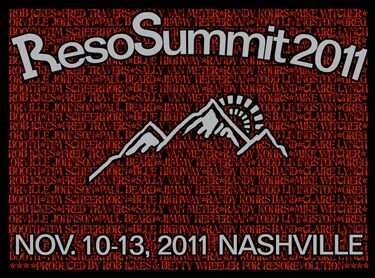 ResoSummit 2011 took place on Nov. 10-13, featuring 81 workshops, 11 stellar faculty (including 2 master luthiers), Station Inn performances by Blue Highway, The Randy Kohrs Band, and the Claire Lynch Band with special guest Mike Witcher, and after-hours jamming into the wee hours. We definitely managed to achieve Total Dobro Overload! A huge thanks to everyone who brought creativity and enthusiasm in full force to the Summit. 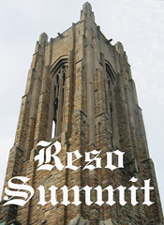 For information on 2012 ResoSummit (Nov. 8-11, 2012), go here. The design for the 2012 t-shirt (click to see a larger image). Collect them all! 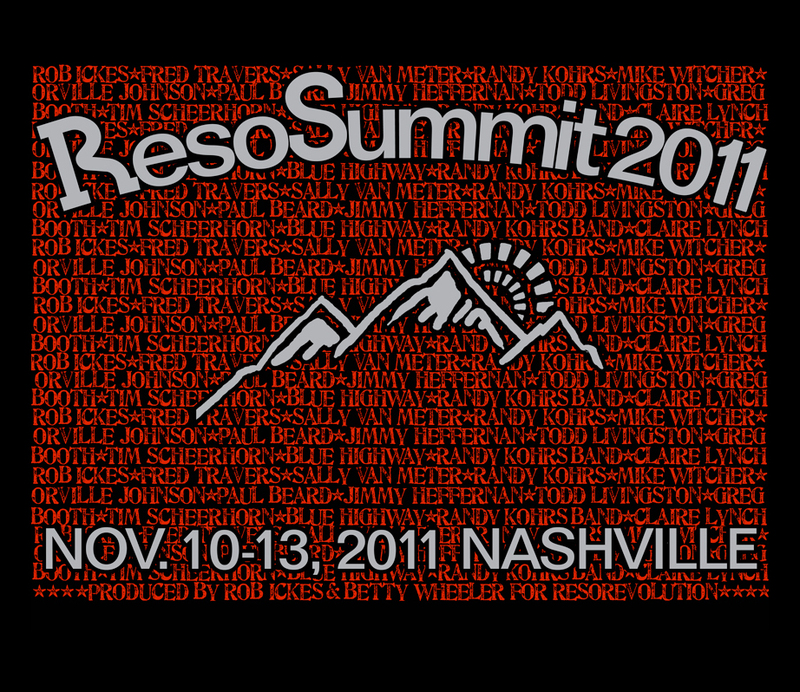 See the menu bar at left for archived information on previous ResoSummits. A big thanks to these friends for their invaluable assistance: The Station Inn, Randy Kohrs' Slack Key Studio, Scarritt-Bennett Center, Jennifer Ickes, Dwight Worden, Jim Hurst, Ben Surratt, Lee Hiers (ResoSummit photographer), Laurel Worden, Pete & Merch Lackey, Claire Lynch, Dave & Christine Hultman, and Pam McLeod. Critics' Pick, Nashville Scene: "Ever the busy bee, resonator guitarist Rob Ickes has for several years now been taking time out of his hectic schedule to preside over ResoSummit, an instructional camp that’s only half-jokingly billed as “total Dobro overload by design.” [By] way of showing off the instrument and some of its best masters, each night finds campers — and the public — gathering up at the Station Inn for related shows. Leading off the stretch is...Ickes’ own group Blue Highway, now approaching the end of its second decade. Not surprisingly, the group is tight as a tick, and Ickes’ inventiveness and subtlety are perfectly contextualized in a way that at once gives his playing plenty of room yet always subordinates to the over-all sound. Randy Kohrs is, in some respects, a more muscular player — which is not to say he isn’t capable of great finesse — and more likely to head for the stratosphere, but no less satisfying. Least known but every bit as interesting is former Nashville resident Mike Witcher, whose usual mellow tone and reflective lines make the occasional bite all the more surprising. It is, as always, a stunning lineup..."